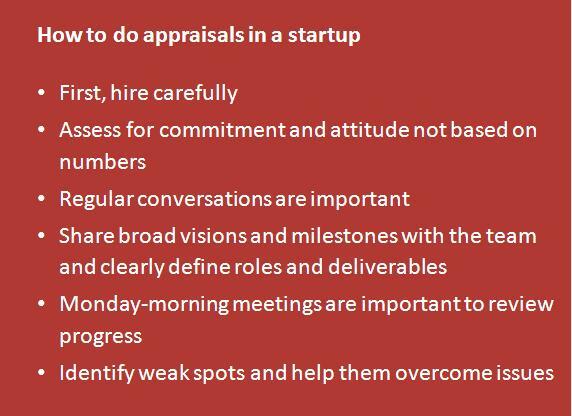 How do you do team appraisals in a startup? The way of assessing a person’s value to a team is quite different in a startup than in a post-startup stage company. In a startup, having absolutely the right people in the initial stages is critical. Because a startup will always be starved for resources, there is just no room for laggards or those who do not fit in with the vision and approach of the rest of the founding team. (And by founding team, I do not mean just the founders, but also initial team members, most or some of them will be with some sort of ESOP’s package). In a startup, there is uncertainty about various aspects, including the product sometimes… but most certainly there is uncertainty about pricing, target customers, value proposition/positioning, target markets, business model, etc. Hence, there is no point in hiring just for a very tightly defined role. Ideally, find people who are willing to adjust to the requirements of the startup. Hence, suggestion number 1: Hire for attitude and willingness to adapt, with passion & commitment to the cause/concept/domain. A person who is passionate, dynamic and a team player will eventually slip into a role that will be most required of him/her to deliver on. I have known people who thought they would do sales in startups, eventually fit beautifully into managing operations. When you are doing ‘appraisals’ of the founding team, the best way to do it is to do it through regular, honest, transparent and candid conversations. There is no point in doing a numbers-based evaluation in a startup. Instead, assess if the person is enjoying the environment, assess if he/she is contributing to the startup in some way or the other (in some cases, there may not be much for the person to deliver on at the current stage.. .e.g. if you had hired a sales person but if the product development is delayed by a quarter or two, what does the person do?). As long as the person is contributing to the team in some way, the person should be considered a valuable resource. E.g. in some cases, the person may be needed just because he/she gets a business perspective or even because he/she keeps the spirits high in the office or because he/she brings to the table the maturity that helps sort out issues between squabbling teams. A good way to do an appraisal is to share the broad vision with the team, clearly identify milestones, define roles and then have a monday morning meeting where each person speaks for 2-3 minutes about what is happening on his/her goals and milestones. (Remember, in most startups the milestones will NOT be met as planned… but as long as the direction and pace is ok, milestones should not be a serious concern). In the Monday morning meeting, discuss where things are not going well.. identify weak spots… and then get the entire team to support the person/team to overcome challenges. If the situation does not improve and if the person is incapable of handling that role, but if he/she is attitudinally right, give him/her another role.. discuss with others. and see how you can ‘fit’ the person in.. do it ONLY if the person is attitudinally right and can be a contributor in someway at some later stage. Hunger to learn, inquisitiveness, passion, commitment are things that you should assess. Previous Previous post: What do you do if all you have is an idea? You are unlikely to get funded… so, how does one get started?